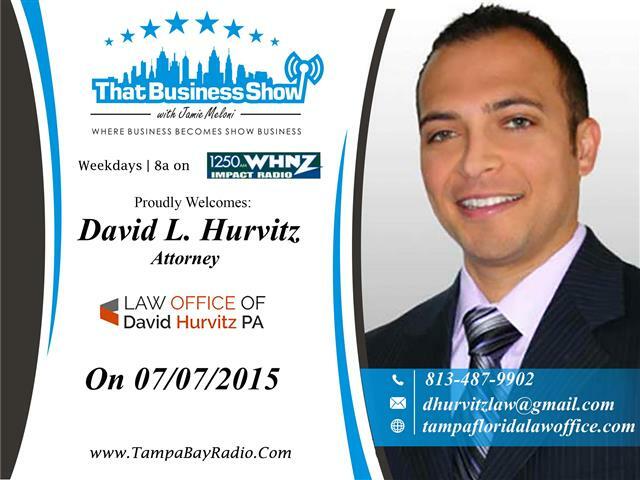 Today on #ThatBusinessShow, I welcomed Attorney David Hurvitz. David owns his own firm, The Law Office of David Hurvitz, PA and specializes in family law but has experience in many other areas of law including Estate Planning, Landlord/Tenant Act, and Employment Law just to name a few. Having been a child of divorce, David has an intimate connection to the field of Family Law and works with couples everyday on the struggles of divorce, child custody and asset allocation. With divorce rates at 50%, David sees financial struggles as the leading cause of divorce in his everyday practice and we touched on some things people can do to better prepare for marriage including pre-nuptial agreements but without a strong bond in friendship and similar interests, many marriages end up in divorce. David touched on some of the basics of child custody issues and dispels my belief that the women always ends up with the children in a custody dispute. David is a graduate of the Stetson University College of Law and also holds an MBA from the University. David is highly qualified and ready to assist you with your legal needs. Reach out to him directly at 813-487-9902 or email at dhurvitzlaw@gmail.com and visit his website at http://www.tampafloridalawoffice.com for more information! My 2nd guest on the program was Jhanavi Pathak, Founder of her newly launched non-profit, The War On Cancer Organization. Inspired by her father’s courageous battle with cancer, Jhanavi founded this 501(c)3 after watching her father pull through devastating disease. She was joined in studio by her parents and she spoke with great passion and motivation regarding this new venture. She speaks of the collateral damage associated with Cancer sufferers and her organization seeks to differentiate themselves from other organizations by focusing not only on the patient’s needs, but those of the family members as well. Jhanavi is looking for investors and companies to get involved in her organization and is in need of volunteers as well to help grow and promote the organization. Reach out to her directly for more information at info@thewaroncancer.org and visit http://www.thewaroncancer.org for more information! This entry was posted in Entrepreneurship and Business and tagged bank owned, business, cancer, entrepreneur, family law, foreclosures, real estate. Bookmark the permalink.